In recent years daily disposable contact lenses are increasingly becoming more and more popular, and eye care professionals are recommending them more. After all, this is the most convenient way of wearing disposable contact lenses, you don’t have to worry about cleaning or storing them. Just one use, throw it in the trash and open up a new one the next day. Who Can Wear Daily Disposables? Where Can You Get Daily Disposable Contact Lenses? The way that most people are willing to pay more for conveniences such as cell phones, faster internet, music streaming, and fast food, it seems easy that people would want to have a convenience such as daily contact lenses. The idea of wearing a contact lens for one day, and throwing them away sounds great, but if you have ever looked at the prices for daily contact lenses they cost nearly double. Convenience – The number one benefit of daily disposable contact lenses is the convenience of them. This type of contact lens is perfect for anyone with a busy lifestyle. You can save a lot of time by not having to worry about a storage case, and contact lens solution. Comfort – Whenever someone tells me that they feel like their contact lenses are uncomfortable, I always ask if they have ever tried daily disposable contact lenses. The reason being is that generally daily disposable contact lenses are made thinner, which means they feel more comfortable in your eye and you are less likely to feel them. 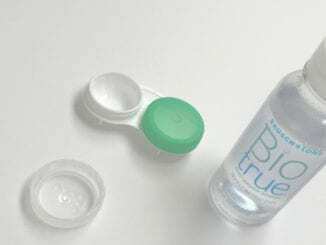 Fresh Lens Daily – If you have ever worn contact lenses before, you understand how it feels when you put on a brand new contact lens from the package compared to putting on the contact lens that you have been using for the past 10 days. It is much more comfortable putting on a fresh contact lens every day. Don’t Have to Store Them – With daily disposable contact lenses you throw them away every day, so you don’t have to worry about finding a storage case to put them in, or contact lens solution to store them with. Fewer Solution-related Problems – There is a less of a chance of having complications with your contact lens solutions such as an allergic reaction to the solution. Less Chance of Infections – Having a fresh contact lens every single day reduces your chances of developing an infection due to improper care or handling of your contact lenses. Although it is important to remember that it reduces the chances of getting an infection, it is still important to remember proper handling. Make sure to always wash your hands before handling your contact lenses. Great for Younger Patients – Parents that have teenagers, daily disposable contact lenses are a great option for them. Teenagers have a higher chance of forgetting or not listening to proper care and handling of contact lenses. Giving them daily disposable contact lenses eliminates this problem and reduces the chances of your teen developing an eye infection. Healthier For Your Eyes – The more often you change out your contact lenses the less likely protein, calcium, and lipids which are found naturally in your tears could build up. These buildups could lead to the development of eye infections. Today there are many different manufacturers of contact lenses and many types of daily contact lenses available. You can find everything from spherical lenses, to astigmatism lenses, even multifocal daily disposable lenses are available if you need them. Even though there are many lens options and parameters there are still some restrictions as far as prescription goes so ultimately it will depend on your eyes. Most of the time it is going to end up being your preference, but to be sure it is best to talk to your eye care practitioner. Well, the main disadvantage of wearing daily disposable contact lenses is definitely the cost. Although as technology gets better and manufacturing processes get better the cost of daily disposables might go down. Aside from the cost environment, conscious individuals might find the amount of waste that is being created by disposable products to be bad for the environment. Well, first off if you do not currently wear contacts then it is important to go get an eye exam. Even if you already wear glasses you still need to get a contact lens exam. There at your exam, you can talk to your eye care practitioner about your interest in wearing daily disposable contact lenses. They should then be able to let you know what options are available to you. After you have your prescription, you can go to your local optical office to purchase contacts, or if you are more about convenience then you can order online and have it delivered to your home. If you have never tried daily disposable contact lenses, and you already wear contacts I recommend talking to your eye care practitioner. They may be able to give you a trial set to try out and see if you like them. There should be no obligation to buy anything just for wanting to try out different lenses. Have you tried daily disposable contact lenses? What are your thoughts on them? Let me know below! As always thank you all for reading, If you have any questions don’t be afraid to leave a comment and I will get back to you.